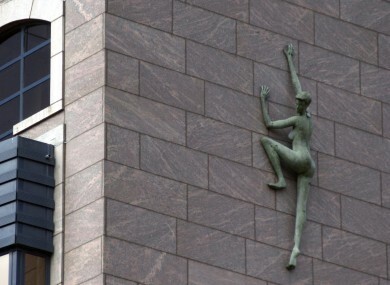 A statue on the side of Treasury Buildings, the home of the NTMA. THE COST of borrowing for the Irish government has fallen today, as the markets get their first chance to offer a response to the deal eliminating Ireland’s promissory note obligations with new government bonds issued instead. The yield on an 8-year Irish bond – the closest to a benchmark 10-year bond that Ireland currently has in public circulation – fell well below 4 per cent today, its first time under this threshold for several years. This evening Ireland would be able to borrow on an 8-year basis at 3.84 per cent, down from 3.98 per cent this morning. By comparison, Spain would pay 4.81 per cent to borrow on the same basis, while Italy would pay 3.90 per cent. Germany would pay merely 1.22 per cent to borrow over the same period. The fall came as the National Treasury Management Agency, the body which manages Ireland’s debts on the Government’s behalf, confirmed details of the new bonds which had been issued in lieu of the promissory notes – and that the promissory notes were no more. “The Minister for Finance’s liability under the Promissory Notes has been discharged and the Promissory Notes cancelled,” it said in a statement. The new bonds – eight in total – fall due in 2038 and every two years between 2041 and 2053, with an interest margin of between 2.50 and 2.68 per cent – plus the ‘Euribor’, the rate at which European banks lend to each other – on each one. Euribor, as of today, stands at 0.372 per cent – meaning that the bonds carry a real interest rate of about 3 per cent on average. The bonds will pay interest every six months, with the Central Bank making most of the profit – meaning the money ultimately ends up back in state coffers anyway. Email “Ireland's cost of borrowing falls as NTMA formally issues new bonds”. Feedback on “Ireland's cost of borrowing falls as NTMA formally issues new bonds”.